GW Devices | Digital Signage – Usage, Future and benefits within the Retail Industry. 19 Apr Digital Signage – Usage & Future within the Retail Industry. Digital signage is a form of communication that uses an electronic screen to display information to consumers. It is a useful marketing tool for retailers, and adoption is now widespread in the industry, as test cases show the advantages of using this technology. Builds Brand Awareness – One benefit of using digital signage is building brand awareness, with 84% of UK retailers believing that it creates significant brand awareness (1). Powerful imagery and quality graphics work well to ensure customers perceive the brand in a modern and positive light. Flexible – The digital nature of the signs means they can easily be adapted for different purposes. They are a canvas for unlimited marketing content that can easily be updated to match current campaigns or show store specific events or promotions. Eye-Catching & Memorable – Bright screens with moving content are much more eye-catching than standard signage, research supports this, with 63% of consumers reporting that digital signage catches their attention (2). This also increases the recall rate with customers; a study by Arbitron found that 47% of consumers remembered seeing a certain advert on a digital screen (3). Better integration – Screens are becoming brighter and slimmer, this allows for a more seamless experience in-store, with digital signage blending in with their surroundings. Responsive content – It is now possible to create digital signs that display responsive content; such as content based on the weather, traffic or time of day. This is a great way to engage with consumers at a time when the marketing message will be best received. Stella Artois implemented this successfully, achieving a 65.6% increase in YOY sales during their weather responsive campaign (4). 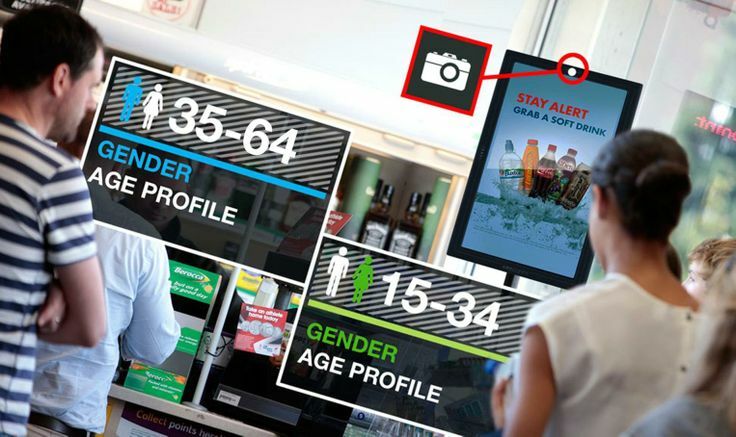 Artificial Intelligence – Signage deployments that monitor eye-tracking, facial recognition and audience reaction are becoming more accurate and affordable, offering up a wealth of information to retailers about how adverts are received. AI can also be used to tailor adverts based on the identified consumer’s demographics, with a growth rate of 25.1% forecast for this sector between 2015 and 2022 (5). Samsung UK Retail Digital Signage Survey. Arbitron Digital Place-Based Video Study 2010. WeatherAds: How Effective is Weather-Based Marketing? 4 Case Studies With ROI Stats. Allied Market Research, “World Facial Recognition Market – Opportunities and Forecasts, 2015 – 2022.